From the beginning of the first millennium B.C., the history of Greek architecture may be summed up in the history of the temple, to the construction and decoration of which all the arts had concurred. There are three systems of architecture, known as orders, the Doric, the Ionic and the Corinthian, the later being a variation of the Ionic, differing only in the form of the capital. To find when and how the temples of the Greeks differ, one should go back to the prehistoric Megaron. There is, in fact, a striking resemblance between the Mycenean Megaron and the first Greek Temple. Both are composed of an oblong rectangular hall divided by a transversal wall into two compartments, the Prodomos or Vestibule, in front, and the Reception or Sanctuary, behind. The resemblance goes further still by the appearance. The Doric order originated on the mainland and on western Greece. It is the simplest of the orders, characterized by short, faceted, heavy columns with plain, round capitals (tops) and no base. With a height that is only four to eight times its diameter, the columns are the most squat of all orders. The shaft of the Doric order is channeled with 20 flutes. The capital consists of a necking which is of a simple form. The echinus is convex and the abacus is square. Above the capital is a square abacus connecting the capital to the entablature. The entablature is divided into three horizontal registers, the lower part of which is either smooth or divided by horizontal lines. The upper half is typical of the Doric order. The frieze of the Doric entablature is divided into triglyphs (a unit consisting of three vertical bands which are separated by grooves) and metopes (the reliefs between two triglyphs). ​​The Greek forms of the Doric order come without an individual base. They instead are placed directly on the stylobate. Later forms, however, came with the conventional base consisting of a plinth and a torus. The Roman versions of the Doric order have smaller proportions. As a result they appear lighter than the Greek orders. The Ionic order came from eastern Greece, where its origins are entwined with the similar but lesser known Aeolic order. It is distinguished by slender, fluted pillars with a large base and two opposed volutes (also called scrolls) in the echinus of the capital. The echinus itself is decorated with an egg-and-dart motif. 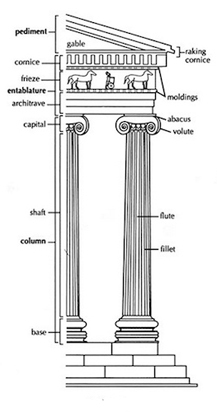 The Ionic shaft comes with four more flutes than the Doric counterpart (totaling 24). The Ionic base has two convex moldings called tori which are separated by a scotia. ​​The Ionic order is also marked by an entasis, a curved tapering in the column shaft. A column of the Ionic order is nine times its lower diameter. The shaft itself is eight diameters high. 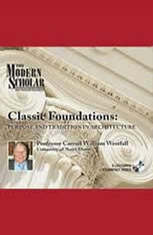 The architrave of the entablature commonly consists of three stepped bands (fasciae). The frieze comes without the Doric triglyph and metope. The frieze sometimes comes with a continuous ornament such as carved figures instead. ​​The Roman writer Vitruvius credited the invention of the Corinthian order to Callimachus, a Greek sculptor of the 5th century BC. The oldest known building built according to this order is the Choragic Monument of Lysicrates in Athens, constructed from 335 to 334 BC. The Corinthian order was raised to rank by the writings of Vitruvius in the 1st century BC. The Romans adopted all the Greek orders of architecture and also developed two orders of their own, basically modifications of Greek orders. The Romans also invented the superposed order. A superposed order is when successive stories of a building have different orders. The heaviest orders were at the bottom, whilst the lightest came at the top. This means that the Doric order was the order of the ground floor, the Ionic order was used for the middle story, while the Corinthian was used for the top story.